^ While Manila proper is designated as the nation's capital, the whole of National Capital Region (NCR) is designated as seat of government, hence the name of a region. This is because it has many national government institutions aside from Malacanang Palace and some agencies/institutions that are located within the capital city. ^ Article 3 of Republic Act No. 11106 declared Filipino Sign Language as the national sign language of the Philippines, specifying that it shall be recognized, supported and promoted as the medium of official communication in all transactions involving the deaf, and as the language of instruction of deaf education. ^ The 1987 Philippine constitution specifies "Spanish and Arabic shall be promoted on a voluntary and optional basis." 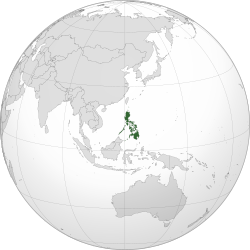 ^ Filipino revolutionaries declared independence from Spain on June 12, 1898, but Spain ceded the islands to the United States for $20 million in the Treaty of Paris on December 10, 1898 which eventually led to the Philippine–American War. ^ The United States of America recognized the independence of the Philippines on July 4, 1946, through the Treaty of Manila. This date was chosen because it corresponds to the U.S. Independence Day, which was observed in the Philippines as Independence Day until May 12, 1962, when President Diosdado Macapagal issued Presidential Proclamation No. 28, shifting it to June 12, the date of Emilio Aguinaldo's proclamation. ^ In accordance with article 11 of the Revolutionary Government Decree of June 23, 1898, the Malolos Congress selected a commission to draw up a draft constitution on September 17, 1898. The commission was composed of Hipólito Magsalin, Basilio Teodoro, José Albert, Joaquín González, Gregorio Araneta, Pablo Ocampo, Aguedo Velarde, Higinio Benitez, Tomás del Rosario, José Alejandrino, Alberto Barretto, José Ma. de la Viña, José Luna, Antonio Luna, Mariano Abella, Juan Manday, Felipe Calderón, Arsenio Cruz and Felipe Buencamino. They were all wealthy and well educated. ↑ "Philippine Population Density (Based on the 2015 Census of Population". September 1, 2016. ↑ "World Development Indicators - DataBank". databank.worldbank.org. ↑ "East & Southeast Asia :: Philippines". The World Factbook. Washington, D.C.: Author: Central Intelligence Agency. October 28, 2009. ओरिजनल से July 19, 2015 के पुरालेखित. पहुँचतिथी November 7, 2009. ↑ 5.0 5.1 5.2 5.3 "Report for Selected Countries and Subjects". www.imf.org. ↑ "Gini Index". World Bank. पहुँचतिथी 2 मार्च 2011. ↑ "Human Development Indices and Indicators: 2018 Statistical update" (PDF). United Nations Development Programme. 15 September 2018. पहुँचतिथी 15 September 2018. ↑ Lucas, Brian (2005). "Which side of the road do they drive on?". पहुँचतिथी 22 फरवरी 2009. ↑ "Presidential Decree No. 940, s. 1976". Manila: Malacanang. ओरिजनल से May 29, 1976 के पुरालेखित. पहुँचतिथी April 4, 2015. ↑ "The Filipino Sign Language Act". Article 3, Republic act No. 11106 of Error: the date or year parameters are either empty or in an invalid format, please use a valid year for year, and use DMY, MDY, MY, or Y date formats for date (PDF). Official Gazette. Government of the Philippines. ↑ Genalyn Kabiling (12 November 2018). "Filipino Sign Language declared as nat'l sign language of Filipino deaf". Manila Bulletin. पहुँचतिथी 12 November 2018. ↑ "Republic of the Philippines Independence Day". United States State Department. ओरिजनल से September 15, 2015 के पुरालेखित. पहुँचतिथी July 30, 2015. ↑ Calderón, Felipe (1907). Mis memorias sobre la revolución filipina: Segunda etapa, (1898 á 1901). Manila: Imp. de El Renacimiento. पप. 234, 235, appendix, pp. 5–10. ↑ Dolan, Ronald E. (1983). Philippines, a country study (4th संपा.). Washington, D.C.: Federal Research Division, Library of Congress. ISBN 978-0-8444-0748-7.